Last month I visited Paris and my trip ended up being more of a gastronomic tour than anything else, you can read more about it here. 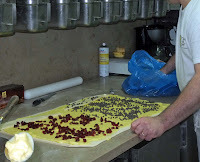 As part of our trip we visited Le Petit Mitron bakery for a behind the scenes boulangerie tour. This trip inspired me to try making bread as it's something I'm rarely brave enough to make. Obviously following my trip I wanted to make something French, so I plumped for brioche and this particular version has chocolate in it too. I didn't really read the recipe very well until I was about to start and it was only then I realised that the bread had to be made in a stand mixer with a bread hook. I've never made bread in my K-Mix before so was slightly worried how it would turn out but I thought I'd give it a go. 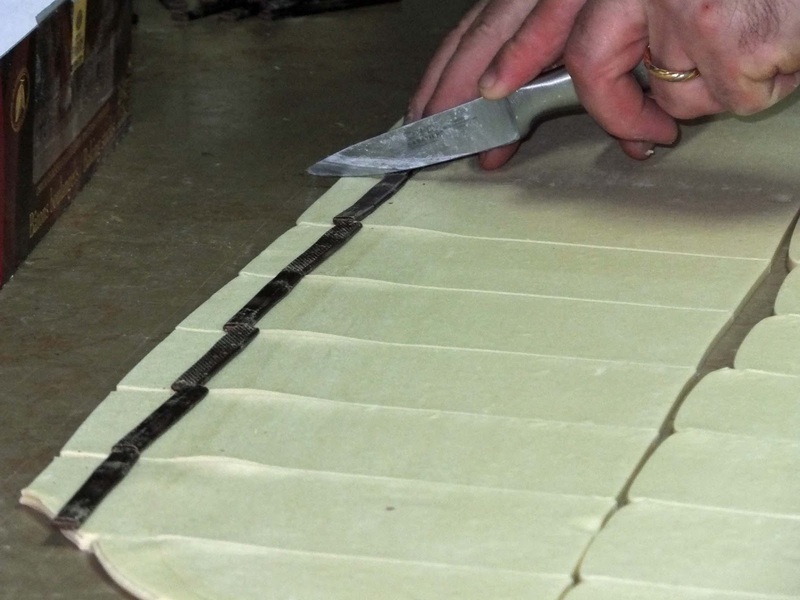 I prefer to do things by hand but this was such as sticky dough that it's a good job I didn't! 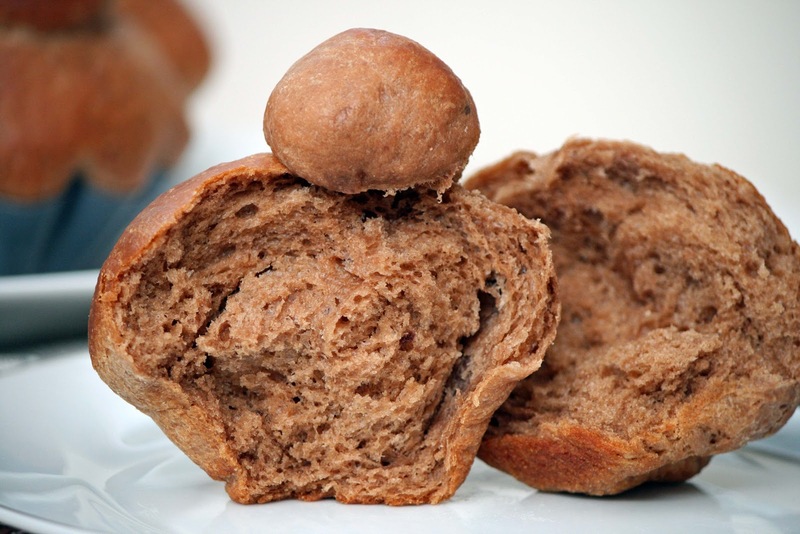 Brioche is a highly enriched bread, there were six eggs, 250g butter, melted chocolate and milk all included in the recipe. When first made the bread was left to rise in the airing cupboard for 2 hours, it was then knocked back and put in the fridge overnight. Then in the morning it was lightly kneaded before being shaped into the rolls before being put back in the airing cupboard for another hour. The last time it went in to rise it was put in a plastic bag that was slightly inflated! Finally, the rolls were brushed with milk and baked for 10 minutes. These brioche moulds are 7cm in diametre...the recipe suggested 8cm so they were a little bit too large when they came out of the oven but by using the moulds you get a lovely traditional fluted edge. These chocolate brioche rolls turned out better than expected and would be perfect warm straight out of the oven for breakfast. They could have perhaps done with a minute or two longer in the oven but overall I was pleased with the result. 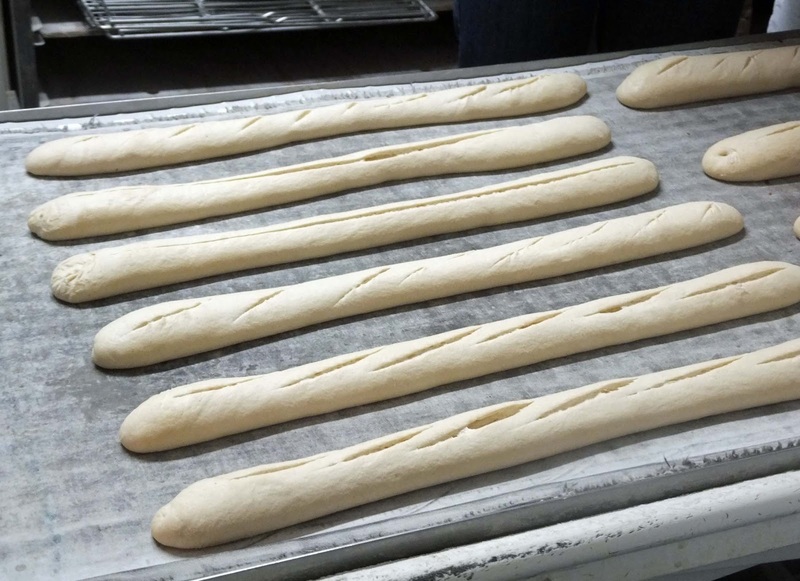 Interesting Fact # 1: French bakeries cannot call themselves a Boulangerie unless they make their bread from scratch on the premises. 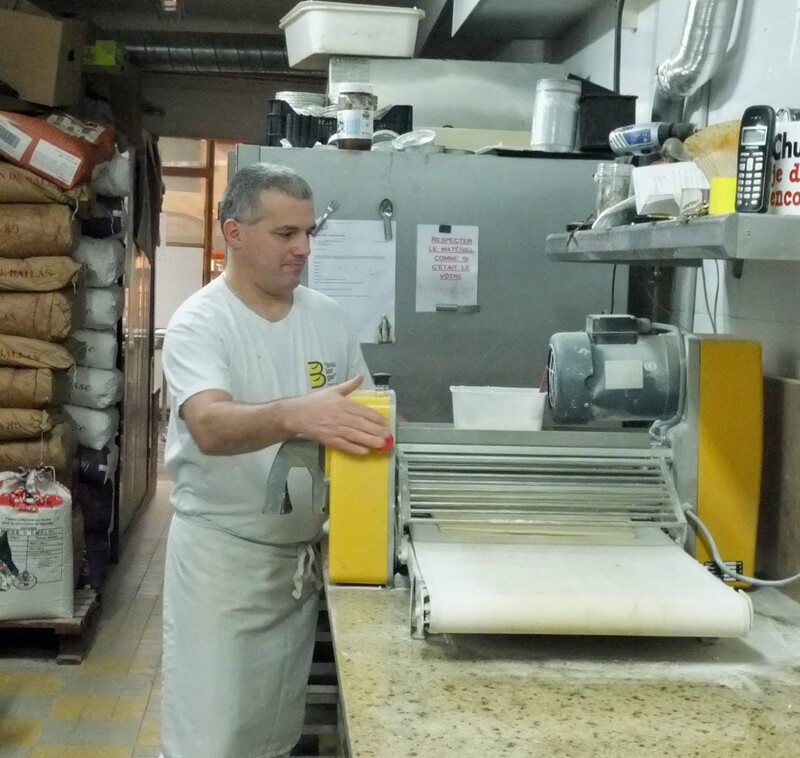 This law was brought in to halt the decline of the traditional bakery. 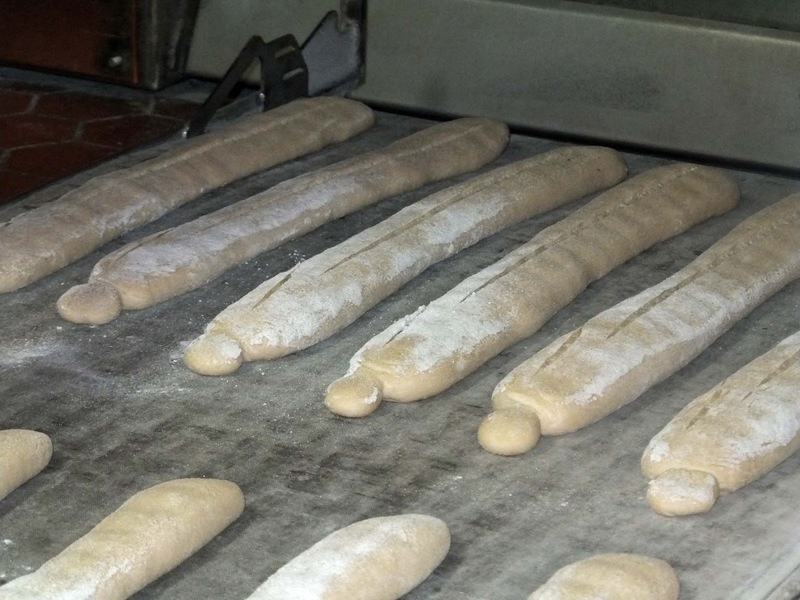 Therefore the French chain 'Paul' cannot call itself a boulangerie as they bake their bread from frozen and the products are made offsite and delivered daily. 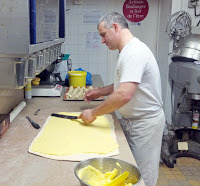 Our boulanger for the day was Didier. He makes hundreds of baguettes a day at all hours of the day as locals pop in before work, at lunchtime and also on their way home. 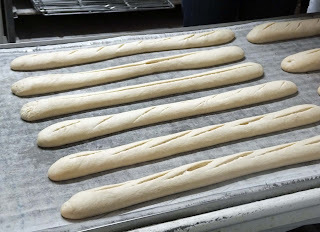 He also makes a special baguette called La Parisse which must be made in a very specific way in order to be called by this name, it is made with natural leaven and has a traditional flavour. You can see La Parisse in the picture below with it's distinctive knob on the top. It even has to be slashed on the top in a particular way! 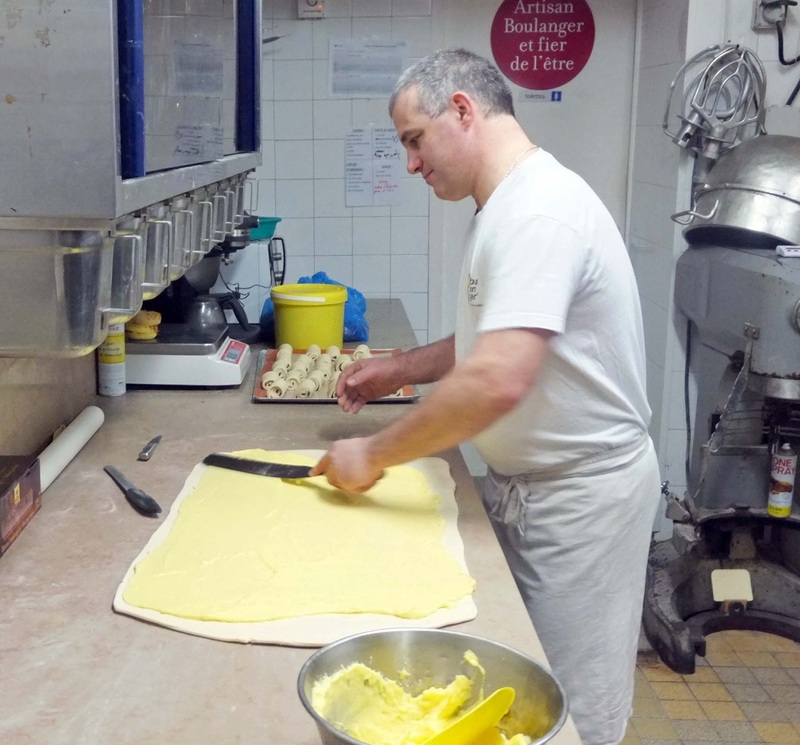 Didier uses a high quality butter in his breads, it's pure butter and is AOC which means it must be produced to very specific standards like the La Parisse baguette. 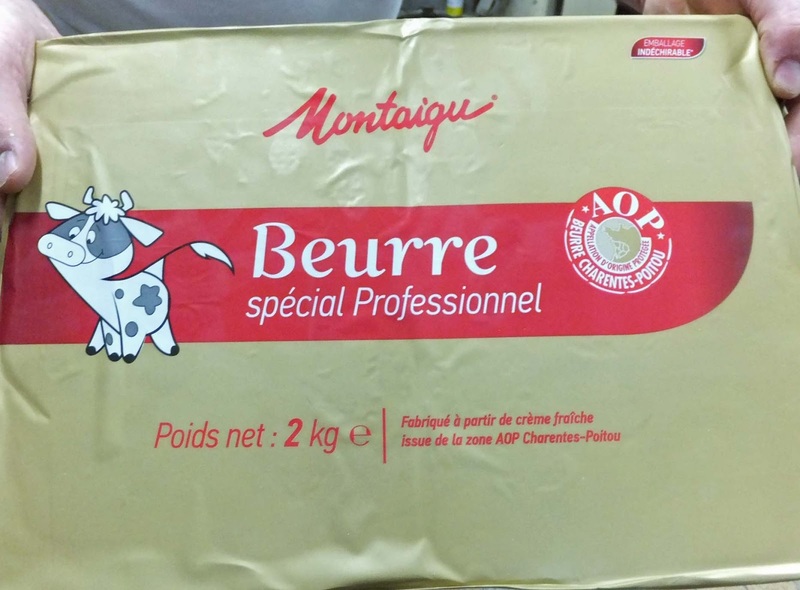 This butter is purchased in 2kg blocks of which there were many in the bakery's industrial sized fridge. Following the explanation and demonstration of the baguette production we even had a go at rolling our own croissants...they weren't bad but certainly not as good as Didier's! Interesting Fact # 2: A croissant that isn't 100% butter cannot be straight but if it is 100% pure butter then it can be any shape it likes! So in general a straight croissant = 100% pure butter, a curved croissant = less than 100% pure butter. 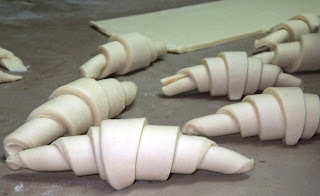 Interesting Fact # 4: Croissants did not originate in France. They are widely believed to have originated in Vienna when it was undersiege from the Turks. When the Turks were defeated local bakers produced a pastry to celebrate which resembled the Turkish cresent...et voila the croissant was born! If you look at the picture below you can also see that when a proper croissant is baked and then cut or broken in half you can see the layers from the pastry circling inside. 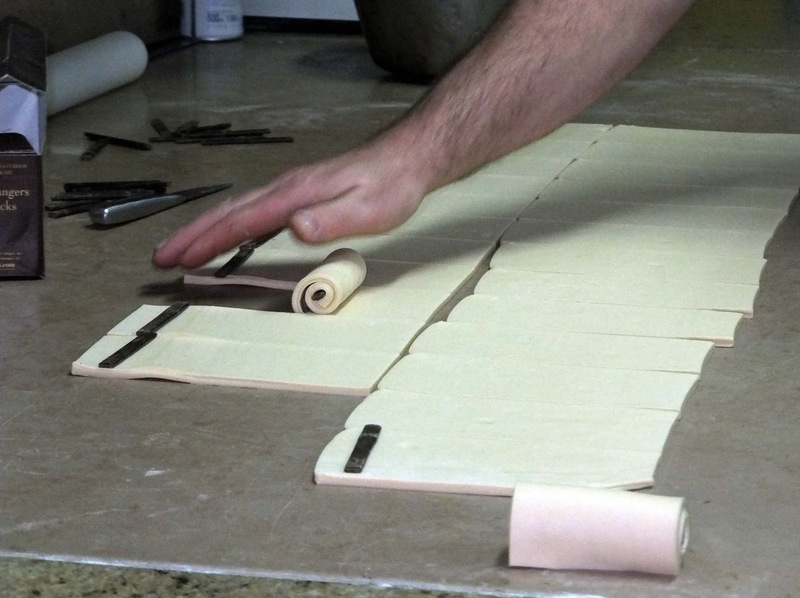 This is as a result of the process by which the dough is made, it is a puff pastry which is repeatedly rolled and folded with generous amounts of butter to create the layers. We also tried our hand at rolling Pain au Chocolat which was a little easier than the croissants as it is just a straight roll. 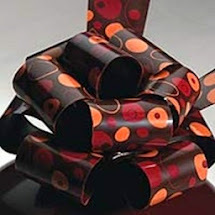 Didier puts two chocolate sticks in each one to ensure it is suitably chocolately. Interesting Fact # 5: The chocolate used is made especially for baking as it is has a very high glucose content which prevents it from completely melting and possibly burning during the baking process. 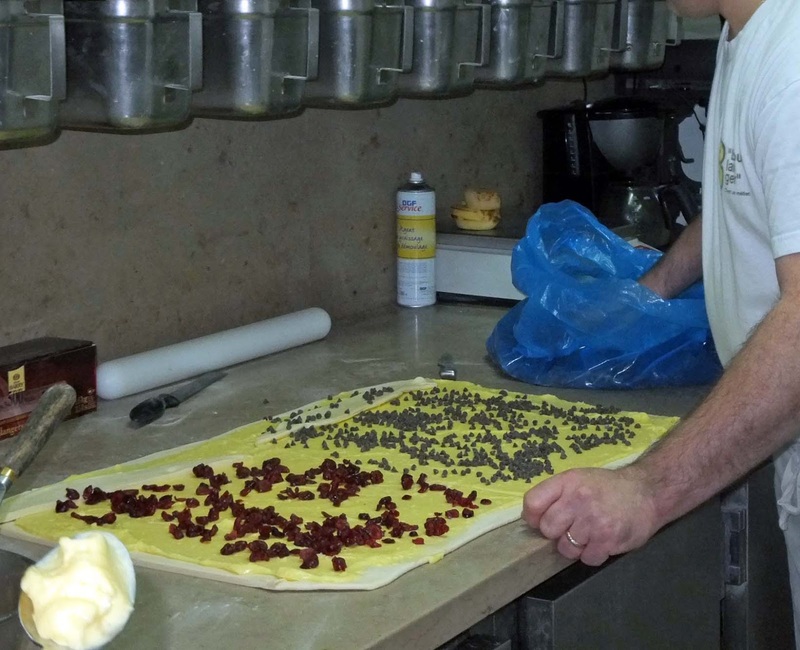 Another of Didier's specialities are Cranberry and Chocolate Chip Escargot or snails...very similar to a Pain au Raisin. You can also see in the picture below that he has a special machine to roll out his pastry perfectly... I WANT ONE! We booked our tour with Viator and I was slightly dubious as to how authentic and intersting it would be, especially at £16 but I was very pleasantly surprised as it was genuinely interesting and Didier was so keen to share his craft with us. The tour was supposed to last one hour but we were there for around an hour and a half and we also came away with croissants and bread. I'd recommend it if you're heading to Paris anytime soon. And so to this month's challenges. First up it's Calendar Cakes with the theme being bread, rolls and buns. 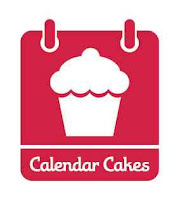 Calendar Cakes is hosted by yours truly and alternately by Rachel over at Dolly Bakes. 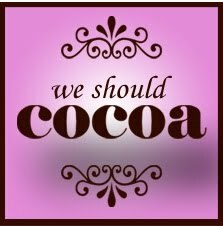 This month's We Should Cocoa is being hosted by Nazima from Franglais Kitchen with it's regular home being at Chocolate Log Blog and Chocolate Teapot. These chocolate brioche fit the theme of bread and chocolate. 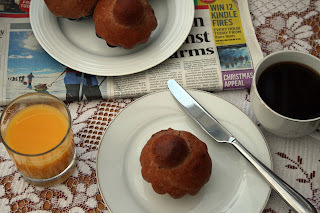 Finally, I'm also entering them into the breakfast club as these really would be perfect on a Sunday morning with the papers, orange juice and a coffee! This month it is hosted by Choclette from Chocolate Log Blog with it's regular spot being over at Fuss Free Flavours. Melt the chocolate along with the milk in a heatproof bowl over a saucepan of simmering water. Once melted remove from the heat and leave to one side to cool. Sift the flour, yeast and 1 tsp salt in a free standing mixer with a dough hook. 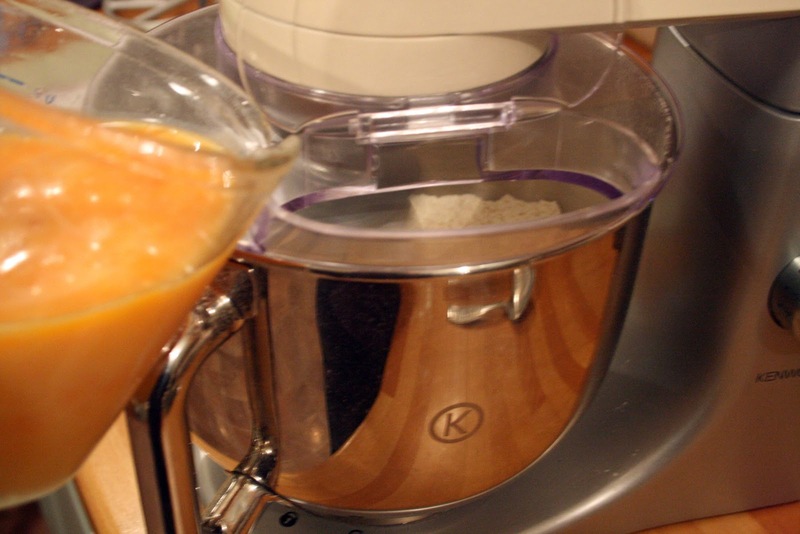 In a jug beat the six eggs lightly and then with the mixer on it's lowest speed, pour the eggs in a little at a time. Once all the eggs have been added, scrape down the sides and then add the chocolate mixture and mix again until the ingredients are all combined. Scrape down again and then knead the dough for 5 minutes on the lowest speed. Put the butter and sugar into a separate bowl and then cream them together until creamy. 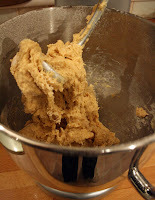 Then add this mixture to the dough a little at a time with the machine running at it's lowest speed. Scrape down and then knead the dough again for another 5 minutes. The dough will be very soft and sticky! 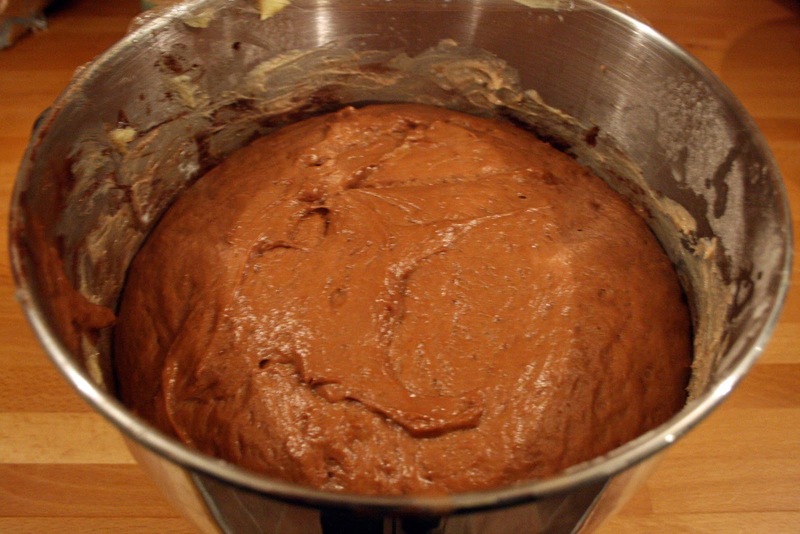 The dough is now ready to rise, cover with a lid or clingfilm and then leave in a warm place for 2 hours - the dough should double in size. Once the dough has risen, ensure you have floured your fingers and then punch down the risen dough, this should deflate it. It will resemble a chocolate mousse or cake mix at this point so don't be alarmed. 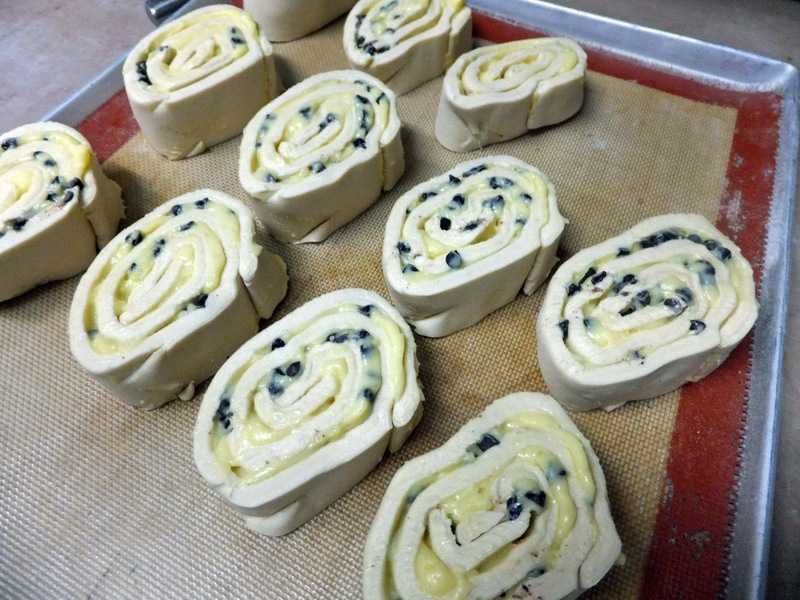 Cover the dough back over and then put it in the fridge and chill until firm and doubled in size again. It should be left for at least 4 hours or overnight if you'd prefer. 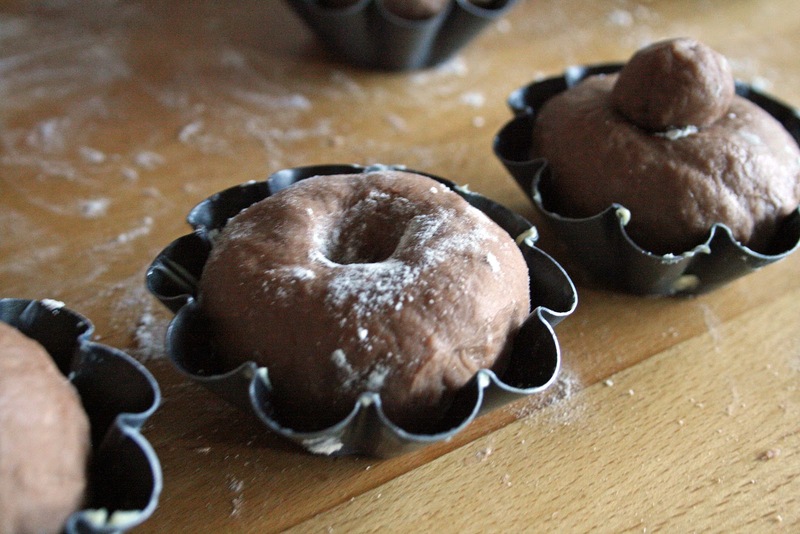 To make the brioche you can either use a 12 hole muffin tin or a 2 x 6 hole brioche shaped tray. I used 8cm individual brioche moulds with fluted edges (makes 18). Whichever you choose they should be well buttered. Turn the dough out and knead carefully for 1 minute. Divide the dough in equal portions as required. 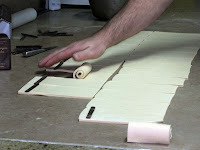 If using the muffin tray split into 12 and 18 for brioche moulds. 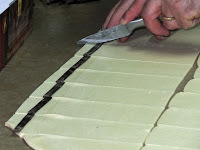 To make the traditional brioch shape, pinch off a small ball of dough from each portion and roll it out smoothly, it should be about the size of a hazelnut. 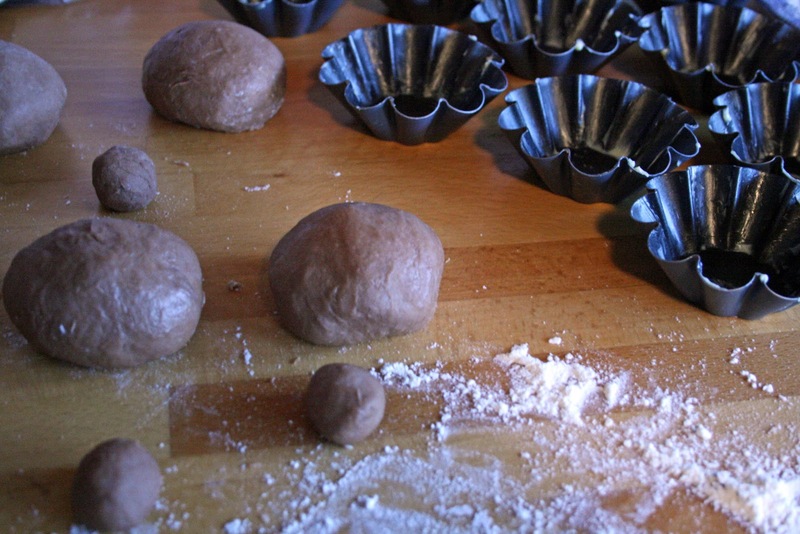 With the remaining dough from each portion make a smooth ball and place it carefully into each muffin hole. Flour your index finger and push it into the middle of each ball of dough in the tray and then place the smaller ball on top of this indent. Put this tray into a large plastic bag, inflate a little and then leave to rise until it has doubled in size. This will take 1 hour in a warm place or overnight in the fridge. To bake, preheat the oven to 200c/180c fan/gas 6. Take the brioche out of the plastic bag and brush with milk to glaze. 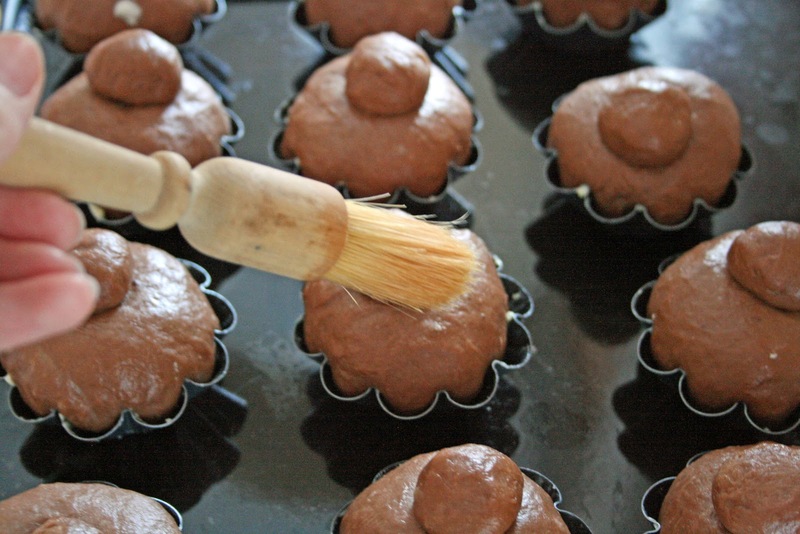 Bake for 18-20 minutes if using the muffin tray, 10 minutes if the 8cm brioche moulds. Leave to cool in the mould for a minute or so before turning out onto a wire rack. You can eat these warm or alternatively they'll keep for 24 hours in an airtight tin. You can also freeze them for upto 1 month. Wow you had a great tour of bread making..wonderful aromatic french bread! Very interesting post! Thanks for the info and the recipes! The tour sounds brilliant - will have to remember it for my next trip to Paris. 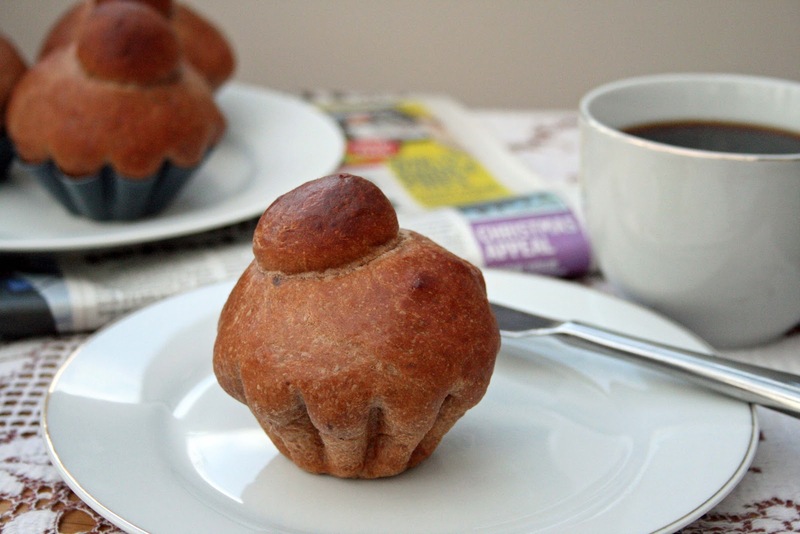 Love your chocolate brioche too - they look delicious! I love your fab croissant facts - straight croissants for me from now on! 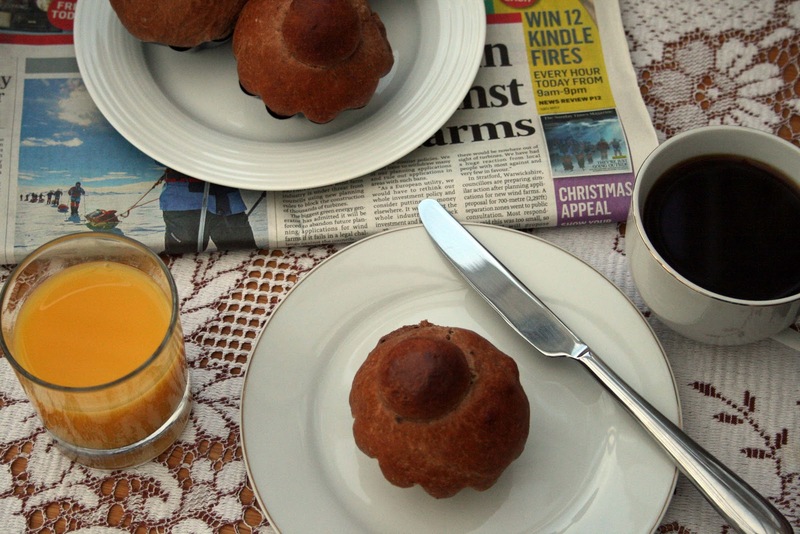 Those brioche look lovely - I've never had the courage to make brioche as the dough seems such a pain to work with. 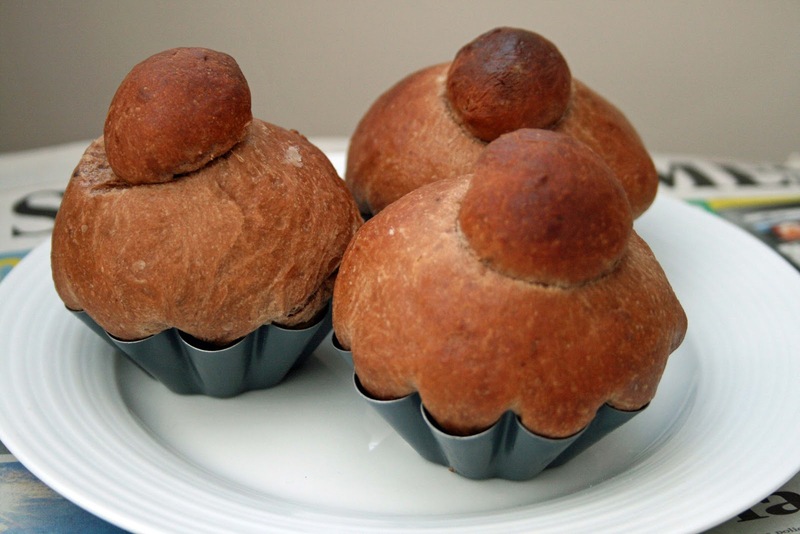 Wow your brioche rolls look so cute and a delicious idea. 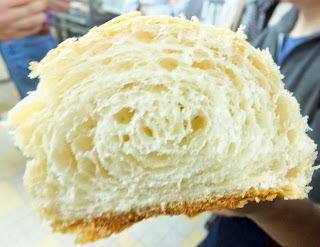 I have tried brioche once though not a great success for me and the amount of butter is amazing isnt it! but well worth it. A keen baker who has also recently become obsessed with cake decoration! After buying yet another cookbook I realised that maybe I spend more time reading about cakes and not enough time baking them... this blog is therefore my attempt to rectify this! 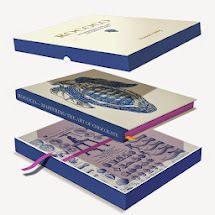 Click here for a guide to using chocolate transfers. © 2013 Laura Loves Cakes. Blog design by Wonder Forest. Powered by Blogger.